Salmon’s Wake is the title of the Ilen Project’s 2019/20 Community and Schools Educational Programme. A programme inspired by a growing though regretful acceptance that the magnificent migratory Wild Atlantic Salmon of the Shannon River, which for aeons were an integral part of the life of Limerick, are fast disappearing, and with them, so many cultural connections to the mystery of creation. Lamentable as this extinction prospect may seem, it does offer us an opportunity to reflect and explore the pivotal moment we now find ourselves at. Happily, it is a moment from which we can drive forward into the future, informed by a rearview mirror towards the past. And so, Salmon’s Wake sets forth aboard the Ilen and its community educational programme, to cross generations and seas. The programme takes its cues from the migratory round of the wild salmon, who set out on an adventure, triumph over ocean challenges and return home transformed. This archetypal adventure pattern may be experienced at an individual and community level, in the elemental splendour of the great Atlantic Ocean, and its local artery the tidal River Shannon. The Ilen Project proposes, this coming July, to sail in its wooden ship ‘Ilen’, from Limerick towards West Greenland in the wake of the wild Atlantic Salmon. This venture will include the participation of Limerick and West Greenland youth in the creative process of building dynamic relationships and discovering what we share as similar North Atlantic maritime island communities. Salmon’s Wake is an intergenerational and international Limerick educational and outdoor adventure programme which will unfold in schools, tangibly through boat building workshops, community days, river, sea and ocean voyaging, and, more diffusely, through the unseen frequencies of the digital web. 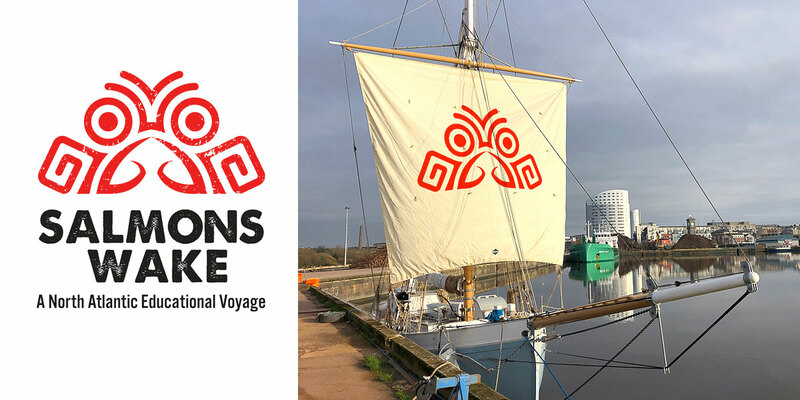 Supported by a broad collaboration of participants that include local schools, artists, craft makers and institutions, Salmon’s Wake will unfold into a creative and active programme at Limerick schools, the Ilen Workshop, Roxboro and at multi locations in the city. Co-ordinaited by numerous facitilators, the outcome of this particular strand of the project will be demonstrated in a celebratory display of craft and artistic endeavour, manifesting in the colourful decoration of Ilen’s Square Sail, and the customary paint finish on the locally crafted Salmons’ Wake cot. When complete it will, as deck cargo be loaded on the Limerick sailing ship ‘Ilen’ and then sail towards the West Coast of Greenland to facilitate direct community participation by river, sea and ocean. We will celebrate the union of all participants and communities with a Salmon’s Wake evening hosted by Watch House Cross Library this coming May 2019.